Coldbird has just released an update to it’s 6.35 Pro LCFW, (6.35 Pro-B4) has been released with a few more bugfixes and features. Not only that, they’ve also managed to release Pro-B4 build for 6.20 (more details on that in this post). This new build includes a new ISO driver called Inferno OSS and includes Anti-NBGI fixes that allows for more compatibility. Again, no need to install the previous versions. You do need to be on 6.35 OFW however. 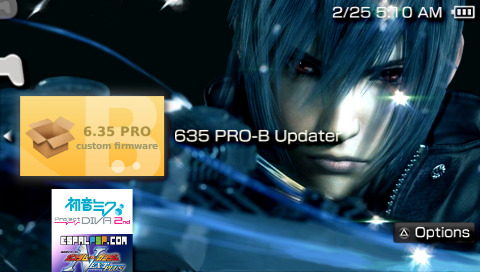 If you’re not on 6.35 OFW and want to install 6.35 Pro-B4, follow this guide: HowTo: Upgrade your PSP to 6.35 OFW. If you encounter any bugs or problems, feel free to post them in the comments. okay b dito yung bookr-mod ebook reader? other plugins? wala namang risk ano? Haha I use english para if ever may mga magtatanong at nakita nila sa comments na nasagot na yung tanong, hinde na ako uulet ng pagpost ng same info. Yep. Ang plugins lang na nagkakaroon ng problems is yung may need ng kernel access (emulators, something more exotic, etc). Is this cfw permanent, like 6.20d patch? My bad! Anyway thanks for all the info you’re sharing in your site! It’s quite helpful for noobs like myself! Question..is it safe to delete the one that was used to installed the 6.35 pro b4 LCFW and just leave the quick recovery behind?im just worried that my lil brother who will use the PSP alot might mess with it and accidentally brick it..thanks! Nope it’s not safe since you will need to files to do the emergency recovery if something happens. oh i see..Is there a way to hide it though?to keep it out of vision then the PSP can still access it when it needs to?thanks! I would recommend the latest build, 6.35 PRO-B9. do i still need to update my ofw to 6.35 or leave it as 6.30? You need to update to 6.35 OFW. The guide on how to do that is linked in the post. do i need the cable for the psp so i can install or can i just use a card reader? Either way is good as long as you can save the file to the memory stick. To easily recover your LCFW if your PSP turns off for any reason, no need to reinstall.